January 2nd is National Pet Travel Safety Day. If you are planning on travelling with your pet, whether driving a short visit to the vet clinic or taking your pet on vacation, here are some things that you need to know to keep it safe and comfortable. NEVER LEAVE YOUR PET ALONE IN A PARKED CAR! Temperatures rapidly become too hot or too cold, which can be fatal. If left alone, animals can become anxious and injure themselves or escape, not to mention cause damage to your car or belongings! Animals must be contained while riding in a car or truck. Cats and small dogs should be secured with a seat belt around a carrier. Dogs should be trained at an early age to be familiar with a padded harness attached to a seat belt. Check out your local pet store for seat-belt friendly harness options. A leash that is attached to a collar can create a choking hazard. We also recommend that dogs not ride in the open bed of pickup trucks, as there is a risk of injury from a fall and from traffic. Do not leave the window down, as there is a risk of strangulation with electric windows and animals can fall out of them. In addition, the force of the wind can injure the blood vessels in their ears, creating blood blisters. Use air-conditioning and heating to keep your pet comfortable. Pets should never be in the front seat, as air bags can injure them if deployed. Also, pets in the front seat may distract the driver or even get in the way of the steering wheel, brake or clutch, causing unsafe driving. 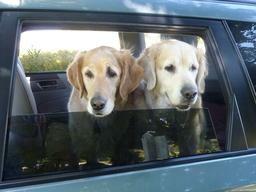 Consider a mesh barrier to create a partition that will keep your dog in the back seat. If your pet is not experienced with car rides, do not feed them in the six hours before travel as a full stomach can cause them discomfort and result in nausea, vomiting and diarrhea. Never withhold water and pull over to offer it regularly on long trips. Acclimatize your pet to a car ahead of time when they are young. Reward them for getting in a parked car with praise and treats. Try taking them on short errands. Health certificate – this contains proof of vaccines, which is required to cross the border to the United States and also serves as proof of ownership. Travel carrier – use a high-quality carrier that will not pop open or break. 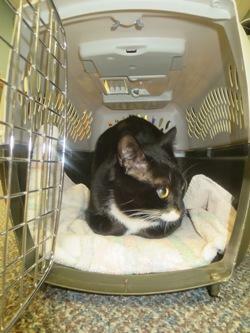 To minimize anxiety, get your pet used to being inside the carrier prior to travel. Keep the open carrier in a quiet place at home, so that your pet enjoys resting inside it. Do not remove your pet from the carrier unless there is an emergency. Your pet may be frightened by the new experience and may try to escape or become aggressive. Food and water – offer chew toys and peanut butter-filled toys to dogs. Bring plenty of food along and protect it from extreme temperatures. Pet ID tag – keep your pet’s ID on a collar in case of an accident or if your pet were to get lost. Microchips also serve a similar purpose. 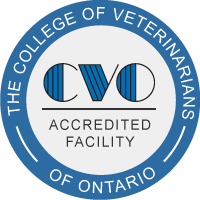 If you have any questions about travelling with your pets, talk to one of our team members at Coventry Animal Hospital.